Interior Minister promises to amend Law of Entry to allow infiltrators' removal. Interior Minister Aryeh Deri (Shas) on Wednesday approved a legal amendment which will allow illegal infiltrators to be removed to a third country, even without their consent. The amendment will be made to the Law of Entry into Israel. 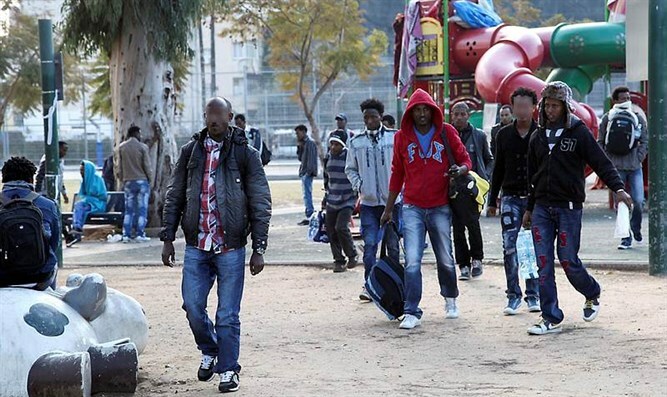 A spokesperson for Deri noted that there are currently close to 40,000 infiltrators from Eritrea and Sudan in Israel. In recent years, Israel has followed a policy of not deporting infiltrators. Only those who agree to leave in exchange for a significant sum of money were removed. As a result, the numbers of illegal infiltrators and "anchor babies" in Israel surged, bringing with it negative social and economic consequences. "I toured southern Tel Aviv, and I saw the daily suffering of the residents," Deri said. "Their lives in the past few years have become unbearable. This difficult reality is also the lot of Eilat, Jerusalem, Pardes Katz, Petah Tikva, Hadera, Netanya, Ashdod, and various other cities around Israel." "It's time to put an end to the affair, and I intend to do work on several levels to help the Israeli citizens who are suffering so much." Deri also intends to present Israeli Prime Minister Binyamin Netanyahu on Sunday with a detailed plan to deal with the issue. During the weekly Knesset meeting, Deri will present the infiltrators' numbers and the effects their presence has on Israelis' lives. He is also expected to demand the government raise the number of Immigration Authority supervisors from 120 to 370. "The Population and Immigration Authority is complaining that the number of supervisors who can enforce the laws regarding infiltrators is not high enough," Deri said. "I hear the same complaints...from residents of neighborhoods where the infiltrators have settled. They complain that there are not enough supervisors." "I intend to insist the Prime Minister, Finance Minister Moshe Kahlon (Kulanu), and other ministers present at Sunday's meeting raise the number of immigration supervisors. This will help improve the lives of Israeli citizens. We must remember that 'the poor of your own city come first [according to the Bible].'" On Monday, Israel's Supreme Court ruled that Israel may deport infiltrators to a third country, but only if they agree to leave. Those who do not agree to leave of their own accord cannot be imprisoned. One synagogue in southern Tel Aviv was taken by the municipality and turned into a supermarket for the infiltrators.